For our Forced Connections project I decided to make a film of an umbrella floating upside down on water. For me the image of an upturned umbrella provided a good metaphor for a boat and felt reminisent of recent images seen in the news of migrants coming to shore in the mediterranean. I also think that it works well as a representation of climate change since we often talk about the weather and rain in Britain. 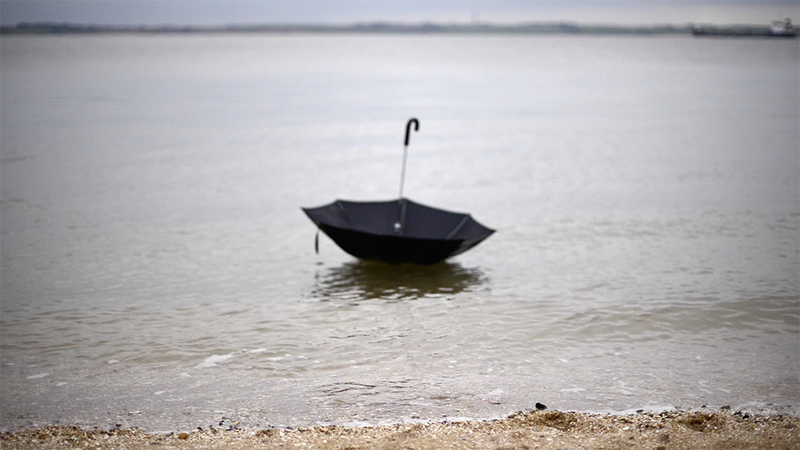 I spent a day at Canvey Island in Essex to shoot the umbrella floating along the Thames Estuary. This section of the estuary is a busy shipping lane, the route from Tilbury Docks out to sea, along which cruise ships and tankers pass on their way in and out of the south east. The shore has a narrow beach and is located at a point where it almost felt like open sea but with the far shore still visible. 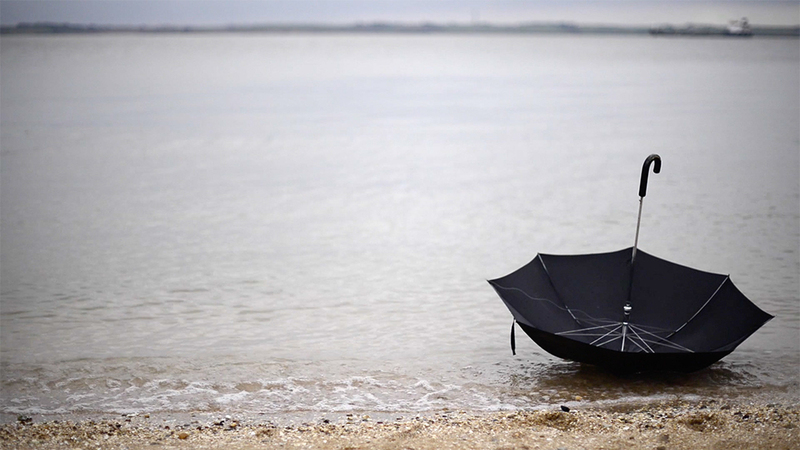 I wanted the umbrella to travel independently in and out of shot from one side of the camera frame to the other. With luck I would also have a shot of a passing container ship in frame with the umbrella. Being on the estuary where the shore is gently sloping meant that the water lapped calmly against the beach rather than forming waves. I tried throwing the umbrella out from the waters edge but couldn’t get it further than about half a metre because of the wind. Sea breaks along the beach allowed me walk out from the shoreline to place the umbrella further out in the water so that there was enough distance for the umbrella to travel from one side to the other of the frame. I made several attempts overcoming various problems of the umbrella sinking and the wind pushing it into shore too quickly before successfully recording a really nice clip, in which it found its way naturally to shore, landing in the bottom right corner of the frame before blowing over and out of shot. The finished film and photographs of the installation I created can be seen here: Take Me, I Will Shelter You.